Harsh paintbrush in bloom, looking south across the large east-facing meadow near the beginning of the trail. This yampah has highly divided and irregular lower leaves as described for Periderida bolanderi, but the upper leaf has only a few lobes, and looks much more like one would expect for P. oregana. 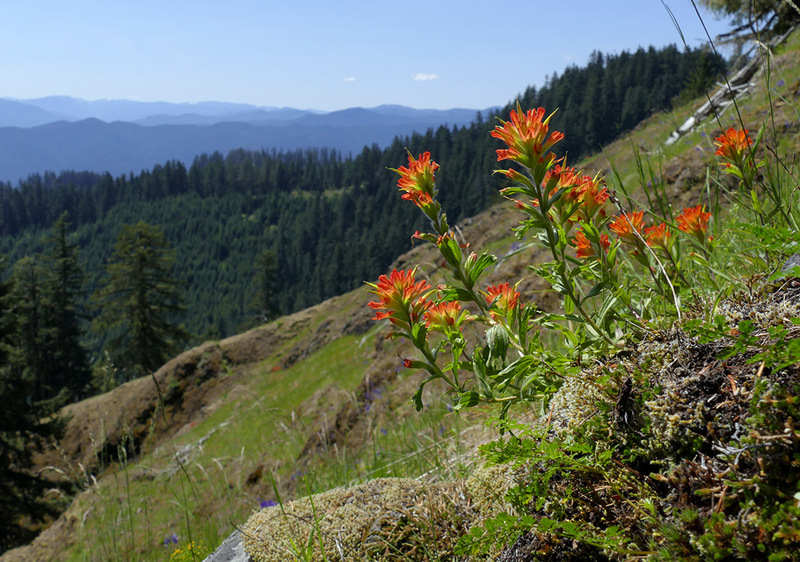 Tire Mountain is one of my favorite spots and one of the premier wildflower destinations in Lane County and in the Western Cascades. Yet I have very few reports on my blog. That is because I had already been to Tire Mountain so many times before I started my blog that I haven’t been very often in the last few years, and it had been 5 years since I’d been during flowering season—far too long! 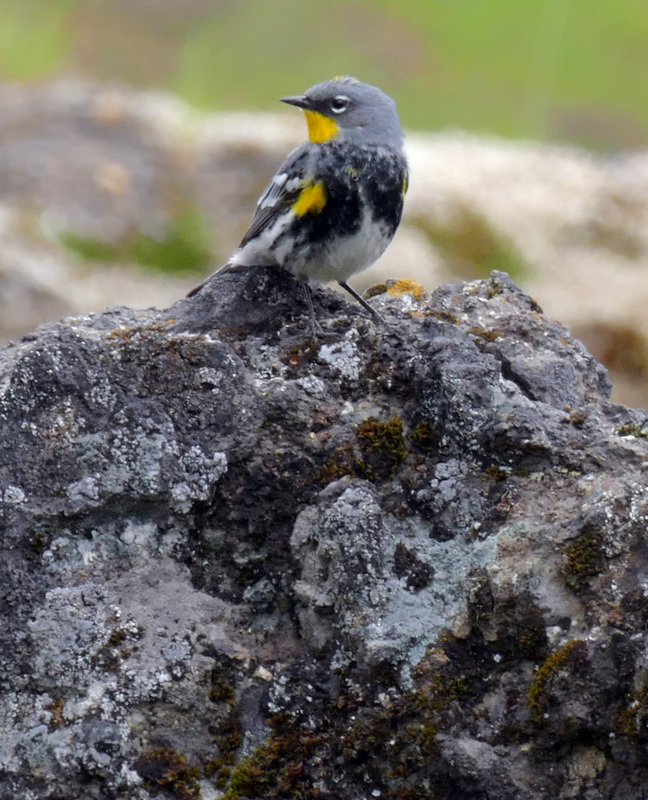 I never had gotten back to check out the lower meadows that I explored in fall of 2012 (see Forensic Botany at Tire Mountain), and I also needed to go back to look at the suspicious yampah that might be Perideridia bolanderi. I was on my own for the day, so it seemed a good opportunity to do some more exploring, and there’s so much to see at Tire Mountain, both on and off the trail. 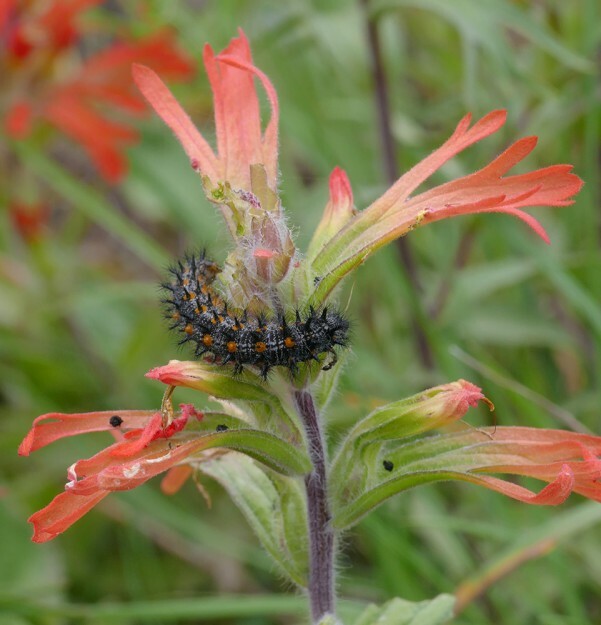 The day started out sunny and clear, and when I reached the large east-facing meadow area, I was greeted by brilliant red harsh paintbrush (Castilleja hispida) and deep blue Menzies’ larkspur (Delphinium menziesii). I headed down the right end of the meadow until I reached the little oak forest that isn’t visible from the trail 300′ above. There were lots of yampah just starting to bud up—a little early, it seems to me, as they usually bloom in July. They almost all seemed to have the highly divided leaves of Perideridia bolanderi. A few had wispier looking leaves or one or two upper leaves less divided than the lower ones. None looked convincingly like P. oregana, but I’d still like to see flowers and seeds later in the summer. At least I have a better idea of when they’ll bloom now. I spent quite a bit of time sitting by an area of abundant Olympic onion (Allium crenulatum), which was attracting a number of cedar hairstreaks. There were some incense cedars in the meadow nearby, so most likely these were their caterpillars’ host food plants. There were as many as three butterflies nectaring together sometimes. They weren’t skittish, yet it still took lots of time and patience to get good photos of them because they were always spinning around the flowers and tipping over out of the light. A few pale swallowtails were flying around, and I saw one duskywing, but there weren’t many butterflies out because of the cool morning and then the clouds later on. There were lots of bees enjoying the flowers, however. 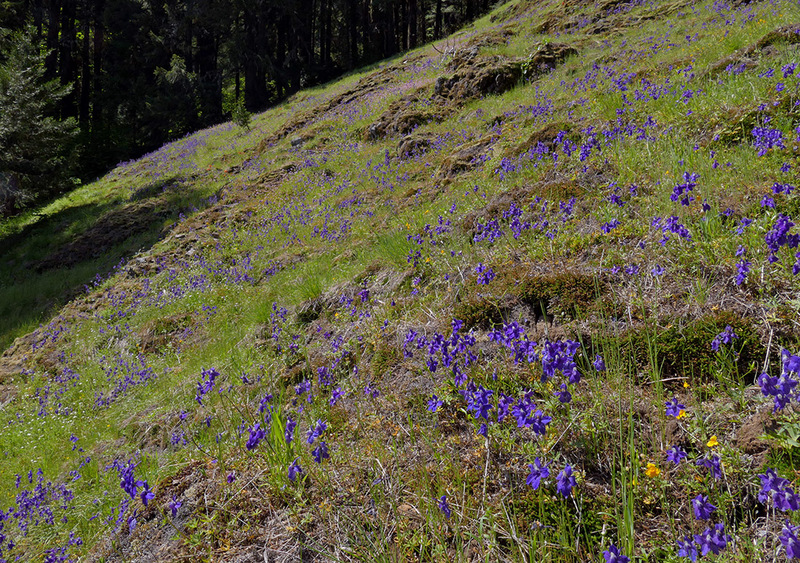 Menzies’ larkspur covers this steep, damp meadow below the trail. I could see a little of the large hidden meadow, so after lunching in the shade, I crossed a dry ditch in the woods and popped out in a steep meadow that was mostly a bit damp and filled with larkspur and fading Thompson’s mistmaiden (Romanzoffia thompsonii). There was a lot of the much larger California mistmaiden (R. californica) as well. Multitudes of rosy plectritis (Plectritis congesta) were in bud, while in a few spots they were coming into bloom. I climbed slowly up to the top and was surprised to see the trail there. On my 2012 trip, I had expected to pop out here, just a short ways from the large meadow, but had instead found the hidden meadow and had to bushwhack through the woods to reach the trail. This time, I’d planned to visit the hidden meadow and ended up doing what I thought I’d do the first time. 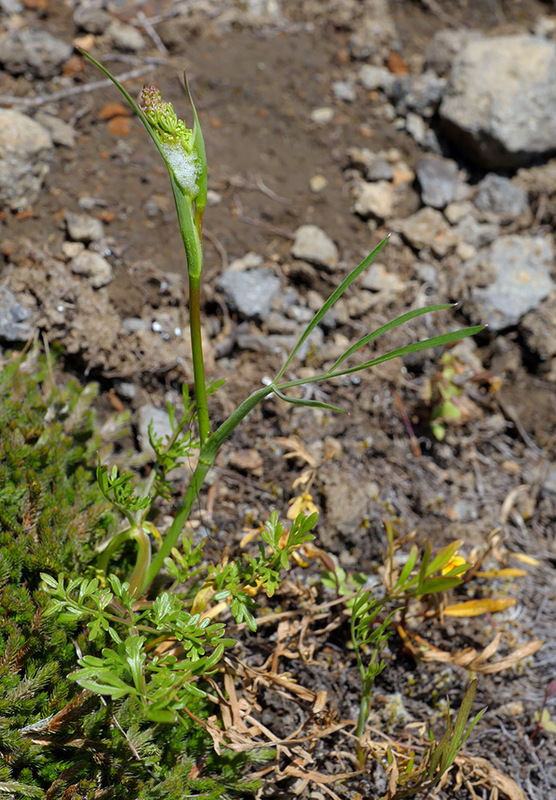 I should have pulled out my aerial photo and checked, but it was beautiful in that meadow, and I even added a new plant to my list: the tiny annual baby innocense (Tonella tenella). I’d never done it because from the top it appears to be way too steep to traverse. I guess ignorance is bliss! Even past peak, the seep-loving beautiful shooting star really puts on a show. The high point a mile or so away is the actual summit of Tire Mountain. The highest point in the distance is Mount June. One of a number of off trail meadows can be seen below the summit to the left. 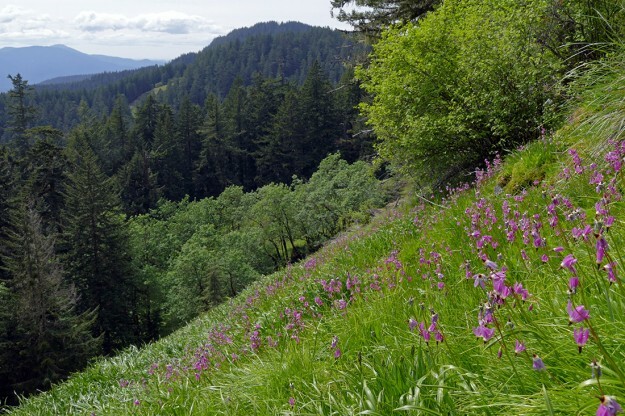 When I reached the next large meadow area, where the trail was quite wet as it usually is early in the season, the beautiful shooting star (Dodecatheon pulchellum) wasn’t finished blooming, although it was definitely past peak. I could see some dots of pink on the rocks up slope. I hadn’t been up there in many years, and the itch to check it out got to me. I climbed up to the top of the meadow, just below the woods. This is fairly near the top of the ridge, so it is a bit easier to walk up here. I passed masses of great camas (Camassia leichtlinii) in bud—it should be gorgeous in a week or so, depending on the weather. There was much more shooting star than I’d realized up here. Harsh paintbrush brightening up the rocky area near the ridge. A glimpse of the “dike meadow” can be seen to the left. Once at the top of the meadow, it is easy to follow it to the main meadow with the large dike. There is a fabulous view the whole way and you see areas and plants not seen from the trail. Above the castle-like rock at the far end of this meadow there was quite a bit in flower. Much of it is seepy, and Thompson’s mistmaiden is abundant. A small patch of deltoid balsamroot (Balsamorhiza deltoidea) was just starting to bloom, and there were several gorgeous plants of silver lupine (Lupinus albifrons) along with lots of harsh paintbrush and barestem lomatium (Lomatium nudicaule). 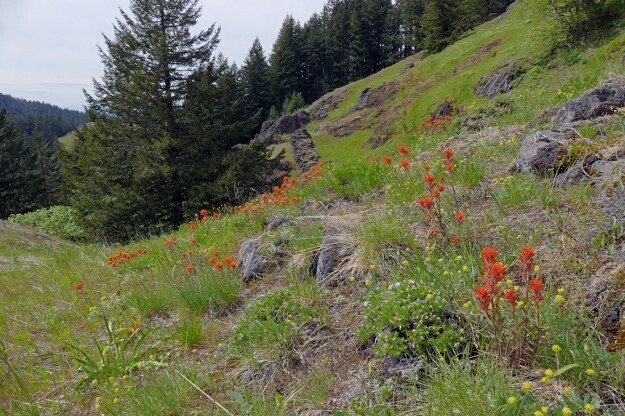 At the end of this large open area, a quick walk in the open woods leads to a small opening, which was filled with blooming fern-leaved lomatium (Lomatium dissectum). I could see the dike meadow through the trees, and the animals had made a decent path through the small stretch of shrubs and trees to reach it. It was definitely easier to ride the ridge in this direction than the way I’d done it years before in the reverse direction. By the time I’d reached the dike meadow, it was clouding up, cooling off, and getting quite windy. I was getting a little tired from all the up-and-down, off-trail climbing, and light wasn’t so good for photography. I decided to do just one more bit of exploration and climbed down the small opening below the west end of the dike meadow. Somehow, I’d never checked it out below. It turned out to be twice the size I’d thought it was, and it had its own prominent dike, but not much was in bloom in this more sheltered area. I could see a lot of buds of cat’s ears (Calochortus tolmiei most likely) and other bulbous plants as well as some rosy plectritis, so perhaps it will be more floriferous later on. The dike meadow itself was blooming well, although it was actually drying out in the thinnest soiled areas. It was farther along than any of the other meadows I’d been in so far. Spring gold (Lomatium utriculatum) was everywhere in perfect bloom, while the Hall’s lomatium (L. hallii) was finishing up. The brownish pom-pom flower heads of fern-leaved lomatium were waving around in the wind alongside the dike and other outcrops. The first bright magenta cliff penstemon (Penstemon rupicola) were coming into bloom on the dike itself. But the highlight was the show of balsamroot, just a hair past peak, so bright it almost seemed like the sun was still out. 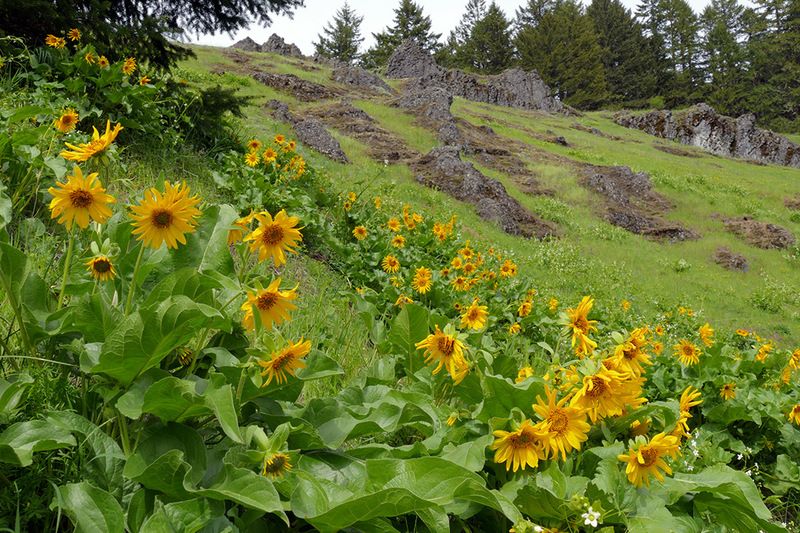 Balsamroot is not that common in the Cascades, so any place it can be seen is special, but a show like this is worth the whole hike. While the yellows of balsamroot and lomatiums will fade soon, there are still many waves of color to come on this gorgeous trail. 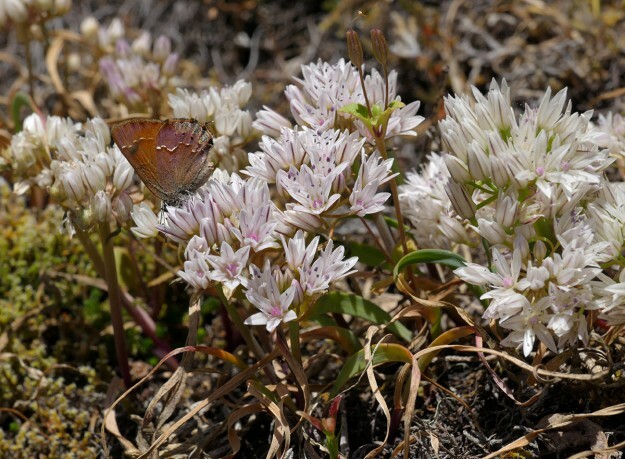 Soon the rosy plectritis will wash pink over the meadows. Then they will turn blue with ballhead gilia (Gilia capitata). And, finally, as the grass is dying back, they’ll go out in a blaze of glorious pink and white when the gorgeous farewell-to-spring (Clarkia amoena) and the more modest yampah cover the meadows. I really will have to get back next month—and maybe then I’ll find my way to the hidden lower meadow I missed this time. So appreciate your blog: photos, info, your enthusiasm. Can’t find my wildflower book so really missing ID-ing stuff I don’t know. Wonderful hike up Saddle Mt (just to East of Seaside) a week ago, lots of flowers but, in particular, stunned by the amount of variety! Beautiful cinnamon-colored black bear on the drive back to Hi 26. Treat of a day. Wonderful to read your hike description. We’ve not hiked tire mt for probably 3 years but I’m keen to go soon.